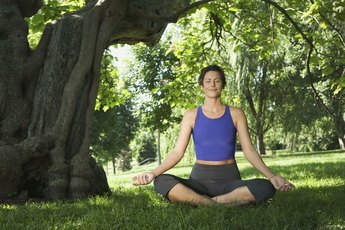 Meditation helps to enhance the body/mind connection. Based on a holistic approach to healing that emphasizes the relationship between the body and mind, Japanese yoga exercises -- Shin-shin-toitsu-du -- focus on the development and balance of ki, the Japanese word for the body’s life energy. Practitioners of Shin-shin-toitsu-du, developed by Nakamura Tempu Sensei, integrate gentle physical movements with mental exercises to develop willpower and self-awareness and foster physical and mental health. Students of Japanese yoga should begin their practice slowly and gradually increase the frequency and intensity over time. According to H.E. Davey, author of "Japanese Yoga: The Way of Dynamic Meditation,” the practice of Shin-shin-toitsu-du is a synthesis of the cumulative experience and studies of its founder, Nakamura Sensei. Under the tutelage of an Indian yogi, Nakamura Sensei learned that the body is a reflection of a person’s thoughts and emotions. Based on his conclusion that the mind and body are one, Nakamura began to teach a series of physical, mental and spiritual exercises designed to guide students to improved health and spiritual enlightenment. Similar to the practice of positive affirmations, Jiko Anji is a method of introducing positive suggestions to replace the negative thoughts and beliefs held in the subconscious mind. Because Nakamura Sensei believed the mind was most vulnerable to suggestion just before sleep, he encouraged students to keep a hand-held mirror near their bed, and speak a single, positive suggestion to their image just before falling asleep. For best results, repeat the process as soon as you wake in the morning, and several times throughout the day. The Muga Ichi-nen and Anjo Daza Ho meditations use sight and sound, respectively, to achieve a calm mind and greater willpower. To practice the Anjo Daza Ho, adapt the seiza posture by sitting on your feet and placing your hands in the lap with your index fingers lightly touching your thumbs. Close your eyes and concentrate on the sounds of a ringing bell. Practice the Muga Ichi-nen in the same position while gazing into the flame of a lighted candle. Japanese yoga exercises, known as Hitori Ryoho, encompass healing techniques for the entire body, including the back, shoulders, limbs, face, mouth and eyes. To promote healing and stimulate your hara, or power center, place your right palm on your navel and cover it with your left hand. Gradually move your hands in a clockwise pattern to enhance circulation and improve your digestion.